DAKAR, Senegal – The key to African economic emergence lies in removal of barriers, increased connectivity between nations and infrastructure development, DP World’s Group Chairman and Chief Executive Officer, Sultan Ahmed Bin Sulayem, told African leaders and top executives in Dakar Senegal. 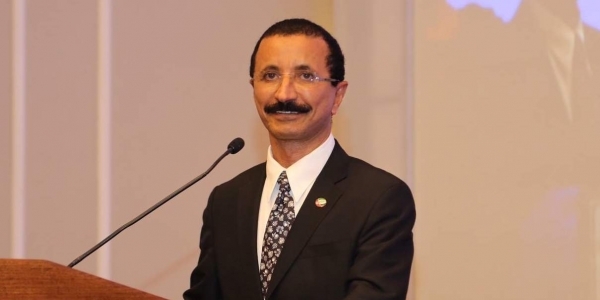 “We believe in the viability of Africa, we believe in investing in the continent during our investment in Senegal we improved efficiency and volumes 135 percent in 10 years,” Mr Bin Sulayem told the audience at the Africa Emergence Conference 2019 in Dakar Senegal. Addressing a panel on how private institutions can help support emergence in Africa with President Macky Sall of Senegal and Prime Minister Mahatir Mohammed of Malaysia Mr Bin Sulayem explained how economic emergence is dependant on increasing inter African trade and infrastructure development. “The Removal of trade barriers is very important. In Africa tariffs are 50% higher in than in Latin America and Asia,” he said, adding that “Intra-regional trade in Africa is only 12% while in Europe, Asia and Latin America is over 50%, we need to improve this to prosper,” he added. Mr Bin Sulayem reiterated the company’s commitment to supporting the economic growth of Senegal and developing Dakar into a major logistics hub and gateway for West Africa during the panel with President Macky Sall. He stressed that as a smart trade enabler, DP World has the extensive expertise and know-how that can help African countries realise their trade and infrastructure goals, while assisting countries to address national ports and logistics infrastructure challenges. He highlighted the importance of developing a logistics infrastructure reflecting DP World’s activities in Rwanda and Mali. “We believe in connecting landlocked nations to the world and international markets. Our logistics park in Rwanda will reduce costs across the country and region,” he said. President Macky Sall of Senegal said to the Audience that DP World helped in the development of Senegal. “What the CEO said is the truth, in Senegal we have experienced a change because DP World was present before I became President with a concession of 25 years at the Port of Dakar,” he said. President Sall added that the government has consolidation of DP World’s presence and are working together finalise new port investments by DP World in Senegal. “Country stability is essential but also the stability of the contracts between the state and the private sector to develop foreign investment. It is evident that the public investment cannot satisfy the basic needs of the population so we need to work with private sector,” he added. DP World has operations in Senegal, Egypt, Mozambique, Somaliland, Rwanda and Algeria and has recently signed an agreement with the Republic Mali to develop a logistics platform and the Democratic Republic of Congo for the countries first deep-sea port. DP World is one of the leading enablers of global trade and an integral part of the supply chain. They operate multiple yet related businesses from marine and inland terminals, maritime services, logistics and ancillary services to technology-driven trade solutions. They have a portfolio of 78 operating marine and inland terminals supported by over 50 related businesses in over 40 countries across six continents with a significant presence in both high-growth and mature markets. DP World aim to be essential to the bright future of global trade, ensuring everything we do has a long-lasting positive impact on economies and society.